Make use of any leftover rice and make the easiest Garlic and egg fried rice in with less than 5 ingredients. it’s a one-pot simple meal in 30 minutes. A great way to use leftover rice and make a simple meal at the same time. A simple weekend meal with fried rice. Here’s how easy it is to make a meal around this garlic fried rice recipe. All you need is a delicious chicken dish to serve the rice with, it’s that simple. If you want to add an additional side-dish, you can certainly add a salad to the mix. 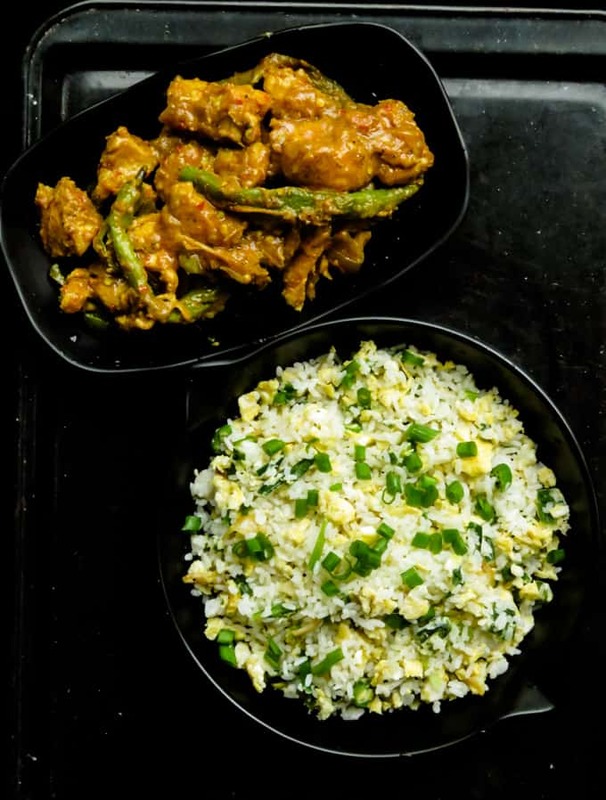 But a meat dish(chicken or beef)is usually all I need to serve with the garlic egg fried rice. Serve the Garlic rice anytime. Lunch, dinner, a midnight hunger buster, you can practically serve this wok dish any time of the day. Did I mention you’ll be using only a wok to assemble and cook the fried rice? Wok to assemble all ingredients. Garlic fried rice without soy sauce. This fried rice is the most basic of all fried rice but full of flavour. 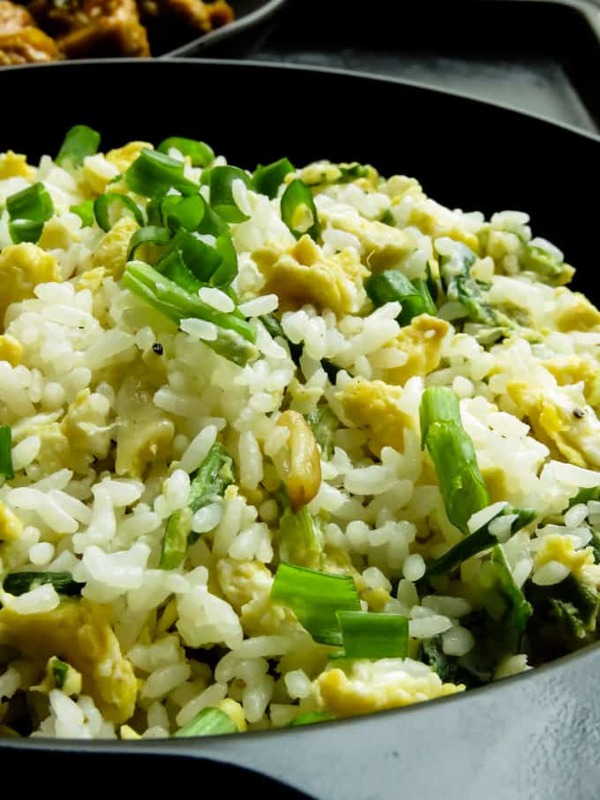 It takes on a more of garlic rice with eggs. I promise despite making the fried rice without soy sauce, this garlicky fried rice really does please the family, especially the kids. 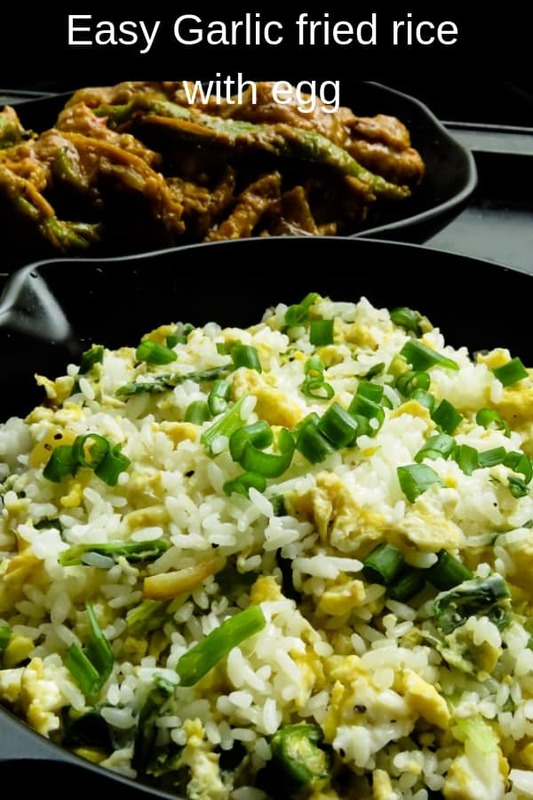 What to serve with garlic and egg fried rice. Since the fried is pretty basic, you’ll want a curry that will compliment the rice. Here are a few meat dishes you can serve with the fried rice. Kangkung soy garlic beef stir-fry. Bell pepper onions teriyaki chicken. 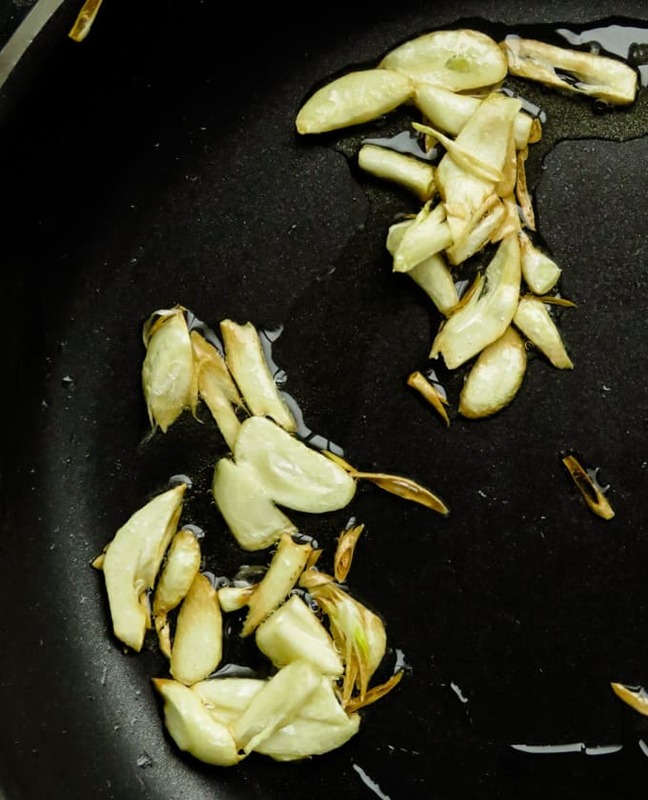 6 cloves of garlic cut into fine slivers. Place a large frying pan/wok over a low-medium fire and pour in the oil. Let the oil warm for a few seconds and then add the garlic slivers, move them around with a spoon and let them turn slightly golden(remember they will continue to brown as you add other ingredients) and release the garlic aroma. As you do this make sure the garlic doesn’t burn. 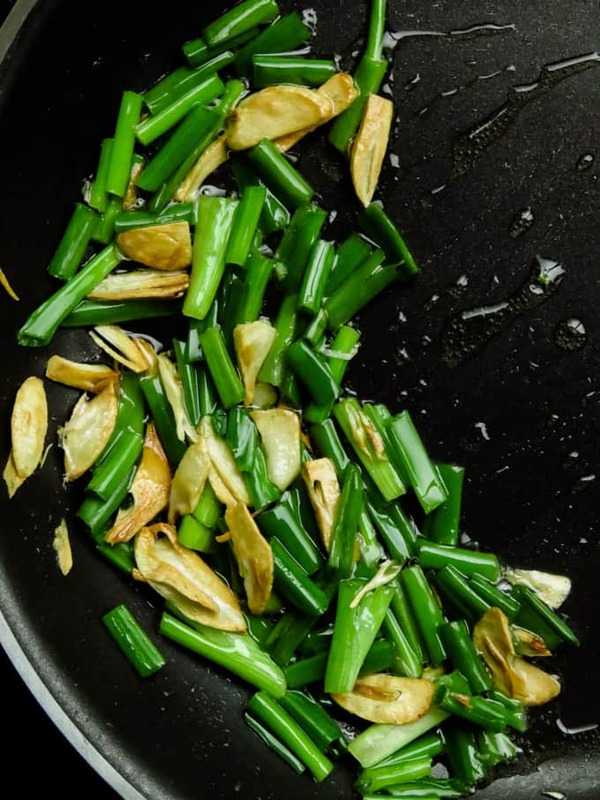 Add the spring onions to the pan and cook for 2 minutes over low-medium heat until they wilt. 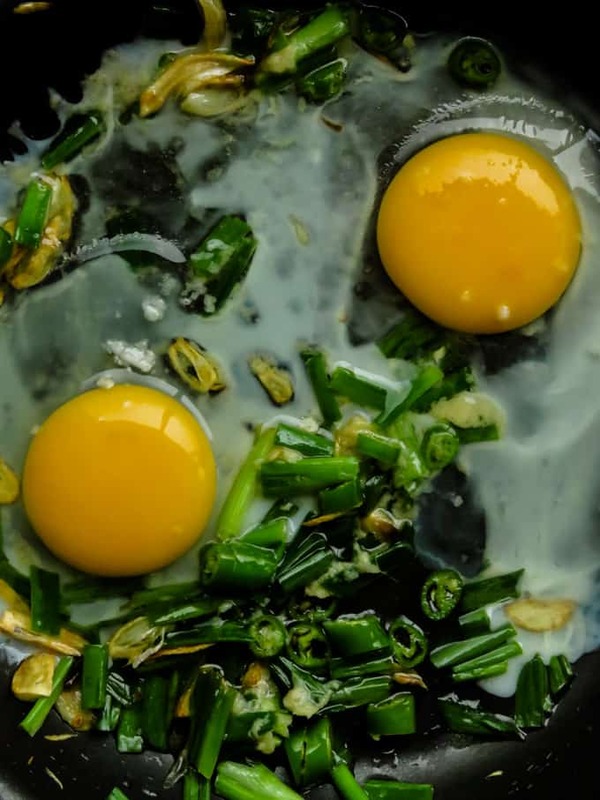 Move the spring onions aside and Crack two(or three)eggs into the pan. Gently fold the egg and scramble over low-medium heat. Season with salt. Make sure at this point the eggs are not cooked until they are firm, you want it to be still soft and slightly runny. As the eggs begin to turn slightly firm, move it to the side of the pan and add the pre-cooked rice. 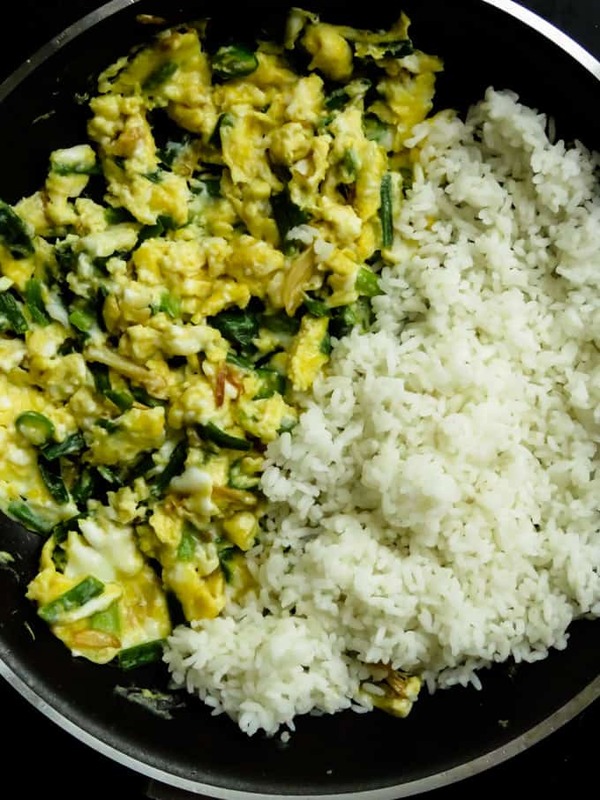 While you break down the rice, combine the egg and garlic mixture with the rice. Check for seasoning and adjust while the rice is mixed with the garlic and egg scramble. Serve warm with your favourite curries. MAKE USE OF ANY LEFTOVER RICE AND MAKE THE EASIEST GARLIC AND EGG FRIED RICE IN WITH LESS THAN 5 INGREDIENTS. IT’S A ONE-POT SIMPLE MEAL IN 30 MINUTES.